Regular cleaning of the brewer’s external components is recommended. Never immerse the brewer in water or other liquids. The Housing and other external components may be cleaned with a soapy, damp, non-abrasive cloth. The Drip Tray can accumulate up to 8 oz. of overflow. The Drip Tray and Drip Tray Plate should be periodically inspected and rinsed clean. To remove the Drip Tray Assembly, simply slide it toward you, keeping it level at all times to avoid spilling. The Drip Tray and Drip Tray Plate should not be placed in the dishwasher. They should be cleaned with a damp, soapy, non-abrasive cloth and rinsed thoroughly. — The K-Cup Pack Holder Assembly can be placed onto the top shelf of a dishwasher. NOTE: Use low temperature cycles in the dishwasher. To remove from the brewer, lift the Handle and grasp the top of the K-Cup Pack Holder with one hand while pushing up on the bottom of the K-Cup Pack Holder from underneath with the other until it releases (fig. 1). After cleaning, align the K-Cup Pack Holder with the opening using the two front ribs as a guide and snap into place from the top. — The Exit Needle is located on the inside bottom of the K-Cup Pack Holder Assembly. Should a clog arise due to coffee grinds, it can be cleaned using a paper clip or similar tool. Remove K-Cup Pack Holder Assembly and detach Funnel. Insert the paper clip (fig. 2) into the Exit Needle to loosen the clog and push it out. The K-Cup Pack Holder is dishwasher safe. There are sharp needles that puncture the K-Cup pack above the K-Cup Pack Holder and in the bottom of the K-Cup Pack Holder. To avoid risk of injury, do not put your fingers in the K-Cup Pack Assembly Housing. The Water Reservoir Lid and Water Reservoir should be periodically inspected and cleaned. The Water Reservoir Lid or Water Reservoir should not be put into the dishwasher. They should be cleaned with a damp, soapy, non-abrasive cloth and rinsed thoroughly. Do not dry the inside of the Water Reservoir with a cloth as lint may remain. To clean the filter screen at the base of your Water Reservoir, empty the Water Reservoir and follow one or all of the following procedures. If you are using a water filter inside the Water Reservoir, remove it before cleaning. Rinse the filter screen with the strong force of water from your faucet. If you have a sprayer, aim the water spray at the filter screen. Fill the Water Reservoir with approximately two inches of clean water and agitate (shake) the Water Reservoir. Empty the Water Reservoir then fill it with clean water and return it to the brewer. If needed, repeat above procedures. cleaning solutions remain in this area as they may contaminate the water supply in the brewer. Mineral content in water varies from place to place. Depending on the mineral content of the water in your area, calcium deposits or scale may build up in your brewer. Scale is non-toxic, but left unattended, it can hinder brewer performance. De-scaling your brewer helps maintain the heating element, and other internal parts of the brewer that come in contact with water. The brewer should be de-scaled every 3-6 months to ensure optimal performance. It is possible for calcium deposits to build up faster, making it necessary to de-scale more often. You should promptly de-scale if the red Descale Light is illuminated (fig. 3). 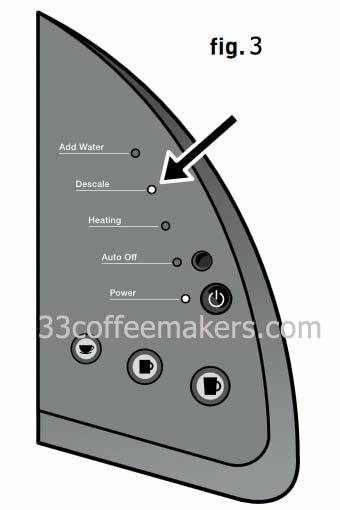 However, even if the red Descale Light is not illuminated you should continue to de-scale your brewer every 3-6 months. Empty the water from the Water Reservoir. If you are using a water filter inside the Water Reservoir, remove it before proceeding. Pour approximately 48 oz. of the vinegar into the Water Reservoir. Fill to and not beyond the MA X FILL line. Place a large mug on the Drip Tray Plate and run a cleansing brew. DO NOT USE A K-CUP PACK, just press a Brew Button. Pour the contents of the large mug into the sink. Repeat the brew process without a K-Cup pack until the blue Add Water Light illuminates. Now let the brewer stand for at least 4 hours while still on. Discard any residual vinegar and rinse the Water Reservoir thoroughly. Ensure the Water Reservoir is filled with fresh water. Fill to and not beyond the MA X FILL line. Pour the contents of the large mug into the sink. Repeat brew process until the blue Add Water Light is illuminated. You may need to perform additional cleansing brews if you notice any residual taste. If the red Descale Light is still illuminated after completing the procedure, repeat the de-scaling procedure above.